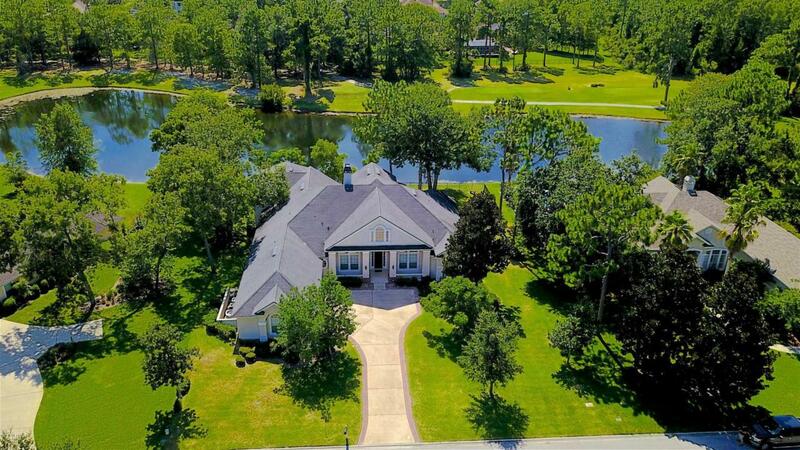 Spacious home in East Gate on lake with view of golf course. Designer features include custom moldings, ceramic tile, wood floors, upgraded lighting niches, build-in cabinets and shelves, gourmet kitchen with maple cabinets, food prep island, breakfast bar and walk-in pantry. 5 bedrooms downstairs & 1 upstairs with 2 closets (or could be children's bonus room). Additional rooms include office/computer room, formal dining room, living room with fireplace, family room and game room/bedroom. Covered lanai is pre-plumbed for summer kitchen. Interior freshly painted. A/C system has 4 zones and was recently updated. Three car courtyard entry garage. Conveniently located with all the amenities available in Julington Creek Plantation.